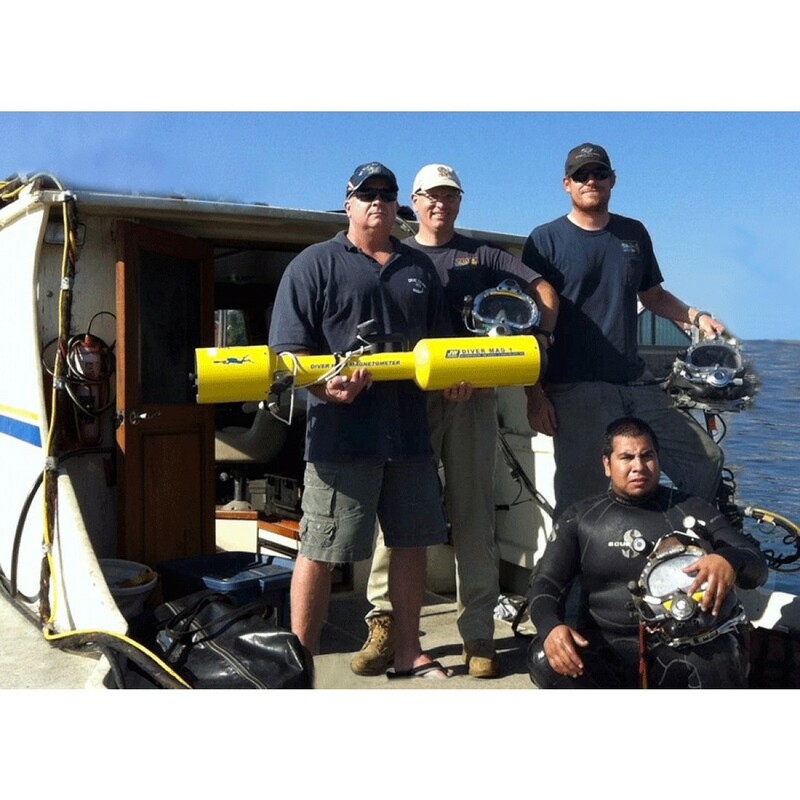 The Diver Mag 1 is a top performing microprocessor driven marine magnetometer detection system with a one gamma sensitivity. 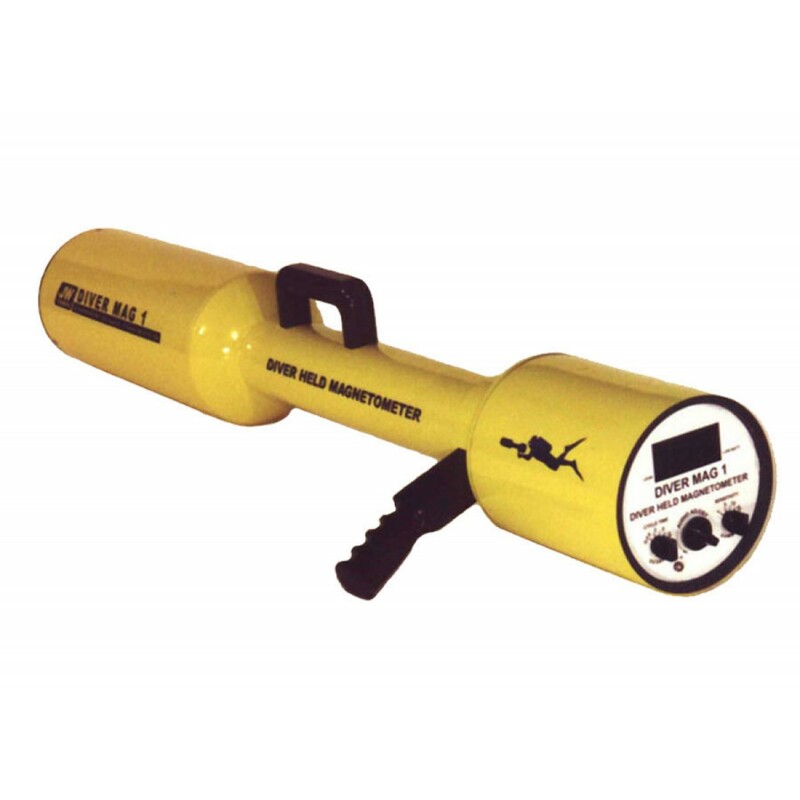 This hand held mag is a super sensitive detector of ferrous metal (iron/steel) that works equally well on land, or underwater. The mag will locate pipe lines, cables, cannons, dredge parts, and just about any ferrous metal object of any size. Ruggedly constructed for commercial operations, the Diver Mag 1 was designed with user friendly controls for ease of operation. Out of the water, the handle grip and included shoulder strap make the mag easy to carry. Operator selectable cycle times (how often a reading is taken) of 2, 5, or 10 seconds allow for a strong return signal and a fast response to detect even small targets. 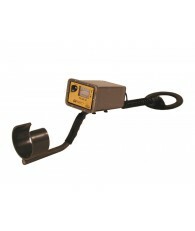 An adjustable sensitivity switch makes pinpointing even the largest of targets extremely easy. The Diver Mag 1 features a tri-axial noise-canceling sensor that let the mag be held in any position without affecting sensitivity or stability of the readout. The readout is displayed on an easy to see 5 digit LED for murky water or night operations. 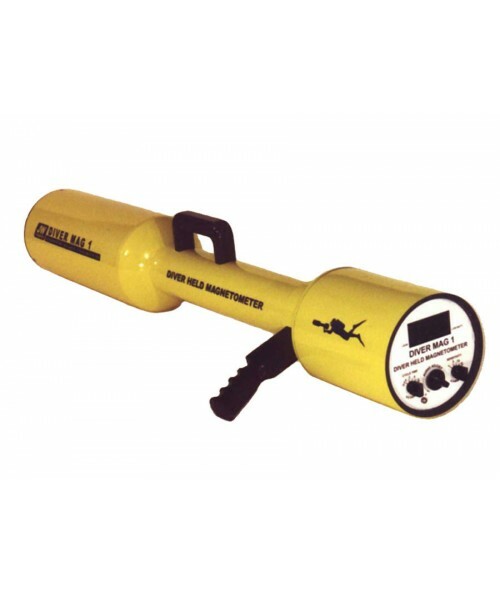 In addition, an audio output allows the diver to operate the system without the need to watch the LED display. 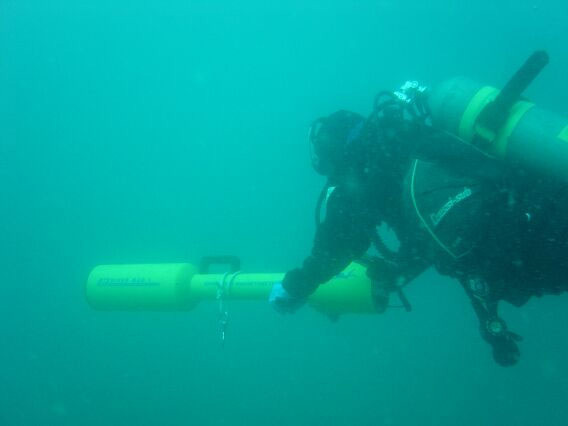 Easy to maneuver with operator adjustable buoyancy, the Diver Mag 1 can be used anywhere in the world. Power is supplied by an internal 12 volt rechargeable battery that will last for two continuous hours at the 5 second cycle time. 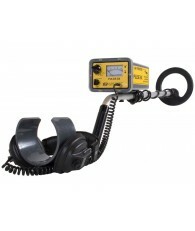 Increase the operating time by using the optional belt mounted spare battery pack. The included battery charger connects to any 120 ac voltage source (220 ac charger is optional). The Diver Mag 1 is constructed of corrosion proof urethane and PVC to give many years of trouble free performance. Modular construction allows for easy field repair, should it ever be necessary. The complete system is covered by Fishers TWO YEAR UNCONDITIONAL WARRANTY. Magnetometers are precision electronic instruments that measure and display the strength of the earth’s magnetic field in an area. If ferrous metal is present, the earth’s magnetic field is altered and the readout of the magnetometer changes accordingly. Since the 1940’s, almost every major wreck find was made with a magnetometer. Metal hulled ships and barges are easy targets and can be detected hundreds of feet away. The Spanish galleons laden with gold and silver (metal not detectable by magnetometer) were also found with mags by detecting the ship’s anchors, cannons, cannon balls, or ballast stones (magnetite was often used as ballast). In the 1960’s, the proton magnetometer (as we know it today) was invented. Since that time the proton magnetometer has dominated the field, both in the scientific community and in salvage work. It is both a rugged and sensitive instrument. The claim to fame of the proton magnetometer is, unlike flux-gate mags, the orientation of the sensor head does not alter the output reading. Once this mag is tuned to an area, no further adjustments are necessary. 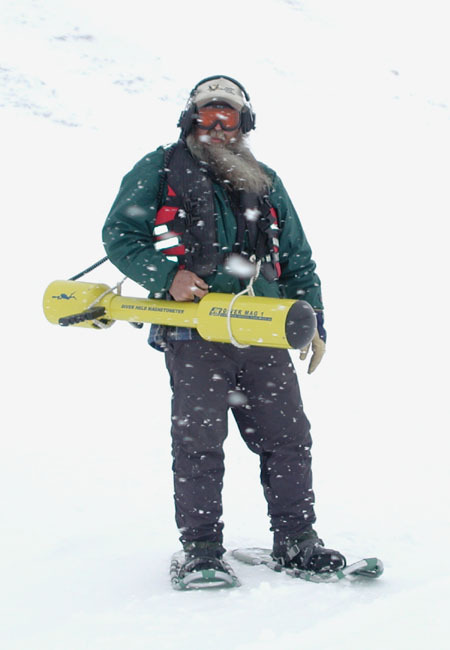 Although specially designed for underwater search operations the DIVER MAG 1 works equally well on land. With it’s extreme sensitivity, any area can be searched quickly and thoroughly. In the front of Diver Mag 1 is the sensor housing. The magnetic sensor is contained within this watertight front housing. The sensor is a state-of-the-art tri-axial noise canceling set of coils that have high immunity to outside interference. The tri-axial concept enables omni-directional operation without the dead zones which can occur with other types of sensor heads. High noise immunity permits operation in electrically noisy areas such as near cities and around boats with older gas engines that have very noisy ignition systems. 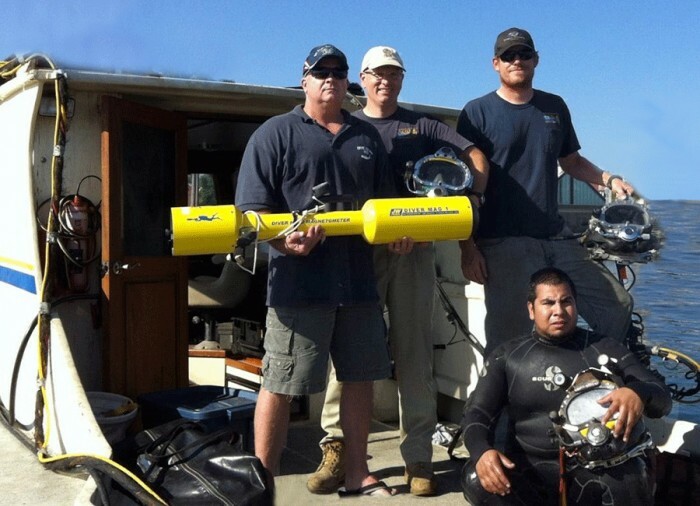 The Sensor Housing has user adjustable buoyancy to enable easy maneuverability underwater and on the surface. The rear of the Diver Mag 1 contains the electronics housing. This housing holds the electronics necessary to control the system. The electronics receives signals from the sensor, processes the information, and displays the readout on the 5 digit LED. A readout is also given on an audio output. The housing contains the rechargeable battery that sup-plies power for the complete system. Leak Indicator : An LED that illuminates if any moisture is detected. Low Battery Indicator : An LED that illuminates when the battery needs recharging. Earphone Connector : Land or underwater earphones can be connected to the Diver Mag 1. Sensitivity Switch : A four position switch allows the sensitivity to be reduced once a target area is located. The target can then be easily pinpointed. Readout : A five digit LED readout that displays the gamma reading. The readout is illuminated which makes it easy to see in murky water or at night. Audio Adjust : A control knob adjusts the audio frequency in the earphone. When a target is detected the frequency shifts indicating the presence of ferrous metal. Cycle Time : A three position switch is used to select a cycle time of 2, 5, or 10 seconds. This switch controls how often a reading is taken. The 2 second time is used when looking for small targets. The longer cycle times can be used to extend the battery life. When you receive your Diver Mag 1, it is complete and ready to operate. All you need to do is charge the internal 12 volt battery (charger is supplied) and the mag is ready to go. The Power On switch on the Control Box is turned on and the mag automatically begins cycling. The gamma reading will immediately be displayed in the readout and an audio frequency can be heard in the earphones. As you approach a ferromagnetic (steel) target, the numeric readout will change and the audio frequency will shift. The amount of change will depend on the size of the target and how close the mag passes to it. A change of several thousand can be expected for a very large target. 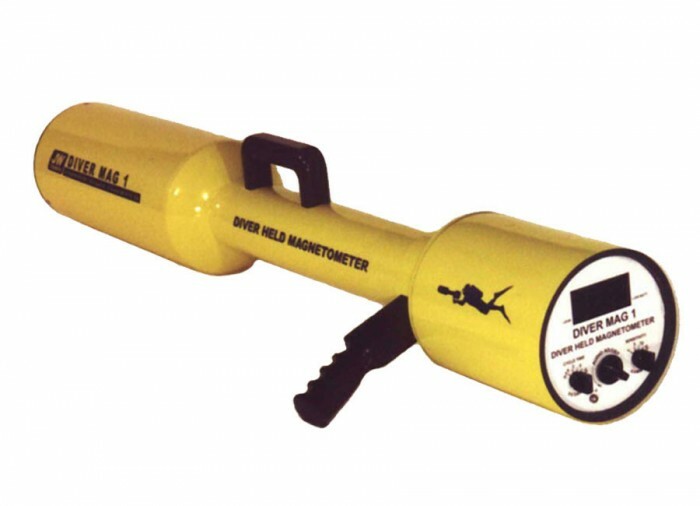 The Diver Mag 1 can easily pin-point objects by reducing the sensitivity once a target is detected. The mag is tuned for your area at the factory and will operate over a very large area (thousands of miles east/west and hundreds of miles north/south) without requiring retuning. The mag can be easily retuned in the field for other areas.